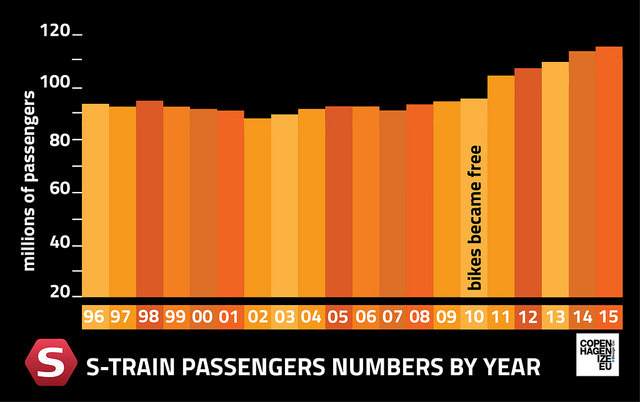 Bikes taking up space for customers of the public transport is a false myth. The reality is that public transport which does not offer convenient free bike transport will never see those potential customers on board. Copenhagen S-train (metro) has shown that since the introduction of the possibility to transport for free the bicycle on S-trains in 2009, the customers increased abruptly. Public transport company DSB understood that is possible to increase your paying customers by offering a convenient service, not a simple seat (which will stay empty if you are not offering what the customer need, and in Copenaghen, customers need to take their loved bike along). While it makes sense to take the bike on a train (on a long route), it does not make sense to take it on a bus for a few kilometres. Built the bike lanes, and there is no need to carry bikes on buses.